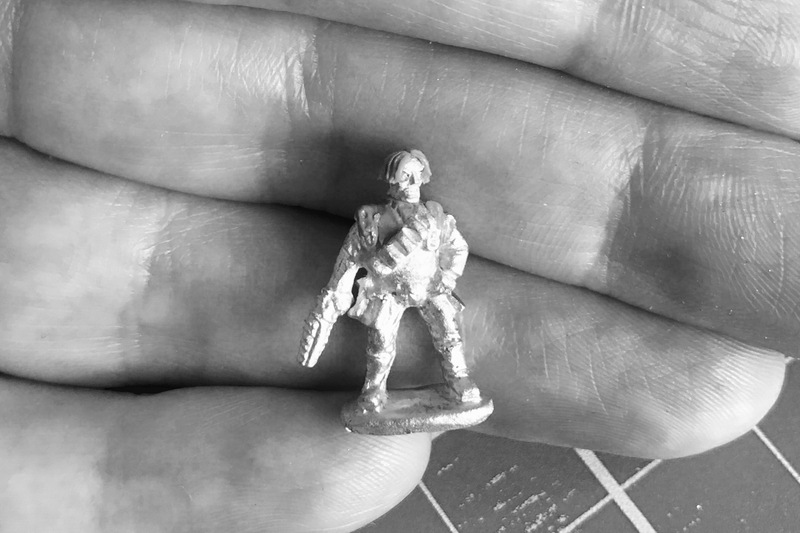 At the moment I’m jumping between 15mm Sci Fi characters and 15mm Conan-ish Desert Fantasy (the project these guys are for) but I’m having toooooo much fun converting Sci Fi 15s – a bit of a revelation! He’s some sort of general bloke from Brigade, with a head from the Slap minis Space Knight and a Critical Mass (soon to be Ral Partha I believe) helmet on his belt. He’ll be playing a character similar to the main character from Image Comics’ Drifter – a sort of washed up space rogue on a backwater planet – I want to run some really small RPG type games with him (attacked by a desert beast, finds a companion, comes across a settlement etc). His hair might change though, not certain it works. Drifter (and some parts of Prophet) are huge inspirations on my sci-fi gaming – I love that western feel without it slipping too much in Firefly (which, controversially, I don’t like). I like western-esque Sci-Fi, as opposed to Western-in-Spaaaaaace I guess. I’ve been stealing lots from the Star Wars Tales from Mos Eisley Cantina and Tales of the Bounty Hunter books too recently – they’re not literary gold, but they are fun pulp. The headswap is a great idea and very nicely done. Did you model the hairs? Thanks – yes, it’s a bit ’90’s boyband’ but it’s good enough.